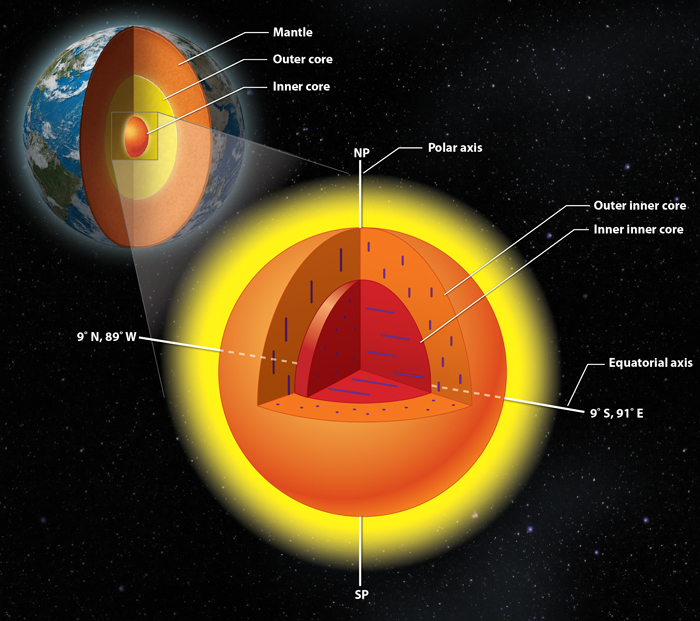 In 2002 Professor Adam Dziewonski and graduate student Miaki Ishii of Harvard discovered that the solid inner core of the Earth was anisotropic, with two different crystal structures, based on seismic studies. They proposed that nested within the solid inner core there exists what they call the ‘innermost core’ – a structure some 375 miles in diameter. In February 2015 Xiaodong Song of the University of Illinois and associates from Nanjing University in China, claim to have have measured the orientations of the crystals in the outer-inner and inner-inner (innermost) cores, as illustrated in the figure. Some twenty years ago, I suggested that the inner core comprises a superconducting current loop which is the source of the dipole geomagnetic field and that the liquid outer core, currently believed to generate the geomagnetic field, is only responsible for the slow distortions of the field. When the Harvard group discovered the innermost solid core, I suggested, in a post, that this was the region in which the high-pressure (FeH) superconductor existed. The north-south orientation of the crystals in the outer-inner core published by Dr. Song are consistent with this hypothesis, i.e. if the outer-inner core solidified closest to the the magnetic field source its crystals would be oriented along the axis of the field. The current in the proposed superconducting core would be pumped up by bursts of charged particles spiraling into the geomagnetic poles, by the laws of Faraday induction and Lenz. The beauty of this scheme is that the effect of both positively and negatively charged particle, at both poles would be additive. However, if the inner-inner core is the source of the dipole field, a ring current must be circulating in it, which should be reflected in a circular orientation of the crystals in it. It is difficult to believe that its crystal structure is linear and oriented in the East-West direction as indicated in the Song et al figure above. This result is somewhat qualified by Dr. Song in an interview, by the two emphasized words: ” … in the inner-inner core, the iron crystals point roughly east-west. Not only are the iron crystals in the inner-inner core aligned differently, they behave differently from their counterparts in the outer-inner core. This means that the inner-inner core could be made of a different type of crystal, or a different phase.” Several papers concerning an East-West ‘lopsidedness‘ of the solid core were published in the May 2010 issue of Science, of which Dr. Song’s team must be aware. Because consensus science is completely invested in the ‘dynamo’ hypothesis, they have apparently never even imagined that the geomagnetic field originated in the solid iron core. This hypothesis is actually proven by the fact that Mercury, the former (2,700 years ago) solid core of Mars exhibits a dipole magnetic field. This current belief in the dynamo hypothesis is so deeply entrained, that the ‘community’ keeps trying to prove that the obviously solid Mercury, has a liquid outer core. ~ by Angiras on February 12, 2015.